Friday was my final day with NSCC Applied Research working full time. When I left Friday the monitoring system was not live. There are still some challenges to overcome with this very large project. When we replaced the wire with CAT5 network wire the system worked for a little while but then we started getting shorted bus errors. Because of the number of connections the resistance on the wire was too high. We will need to solder the connections instead of using quick connect clips in order to improve the signal. The WEL sends 5V over the 1-wire bus and because of the amount of quick connects we used for sensors runs we were getting too much resistance and noise on the line. We reduced the system to include only one of the evacuated tube collectors and the signal returned to normal. Once the soldering is done we can include the others again. Our network connection is browning out as well. We are able to get a wireless signal on the roof with the equipment we have but we can’t keep it connected. This meant we couldn’t go live with the system. We will need to replace the antenna with something stronger. We have an access point on the roof for the solar photovoltaic monitoring and we may need to try connecting through that as well. That would require significant changes to the way the photovoltaic monitoring system communicates though so we would consider that a last resort. I leave the project in the very capable hands of Dr. Alain Joseph and they rest of the crew. They will continue to move the project forward and I expect to see the system live this summer. I prepared a manual for them documenting the process of solar hot water monitoring using the WEL. I’m sure that will provide them with the knowledge transfer required for someone else to step in and continue the project. I have also agreed to offer them support on a part time basis as needed. The experience of working on a large project like this one has been very valuable to me. We’ve worked through a number of different problems, and learned to anticipate things to go wrong. I know now that I shouldn’t expect anything to work right the first time. I also learned the importance of documenting your work properly, so that others can pick up where you left off. Getting a pyranometer to work with the Web Energy Logger (WEL) was a long process for us in the lab. 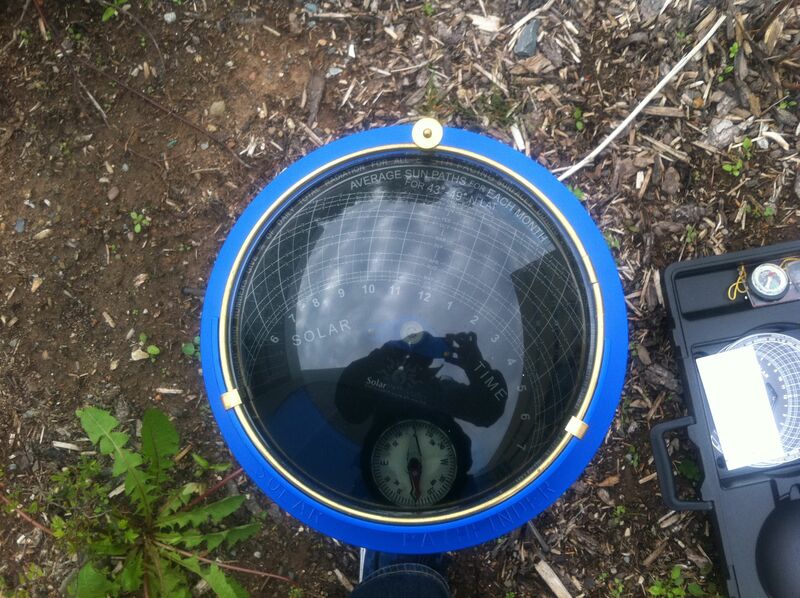 A pyranometer is a device that measures the solar intensity in watts per meter squared. We used a 0-5V pyranometer from Apogee (http://www.apogeeinstruments.com/pyranometer/). This was a challenge because the WEL does not have a 0-5V input. We needed to convert the signal to 4-20 mA so that it could be read by the WEL. There is a benefit to 4-20mA though since it is a current signal and not voltage it doesn’t drop off when you use a long wire run. Originally we had an electronics student design us a signal converting circuit board because we had the tools to design and mill circuit boards here at the college. We found a company that manufactures boards like this (http://controlsignalconverter.com/) and it is much more practical to purchase them then make them in most cases. When testing the pyranometer we noticed that the 4-20 mA signal would drop off around the 12 or 13 mA mark and saturate. The WEL would never receive the full 20 mA. We ran numerous tests with our equipment and determined that the problem was within the WEL itself. We spoke to the manufacturer of the WEL and he explained the problem and how to fix it. It requires some cutting to fix it. 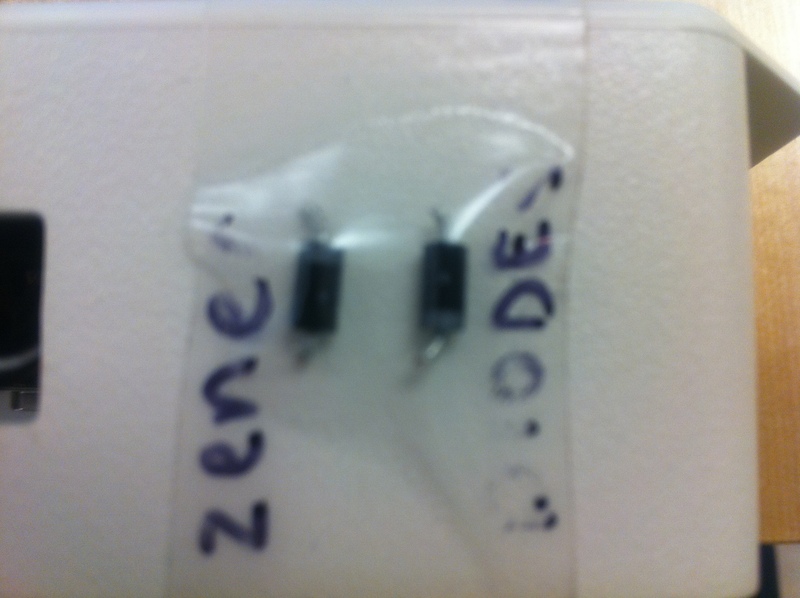 There are two zener diodes inside the WEL that need to be snipped off. To do this you need to remove the rabbit board network chip by wiggling it and lifting it at the same time. It is fairly snug so you will need to work at it to get it off. Once it is off you will have access to the zener diodes and you can snip them out with some wire cutters. You will see them next to the green 4-20 mA plug on the WEL sandwiched between two resistors. I took a picture of our board with them removed below and have identified where they used to be with a red circle. Once we removed the zener diodes it worked perfectly. You need to scale the numbers in order to get the proper engineering units. We used the formula f(x)=78.125x-312.5 to convert the 4-20 mA signal into watts per meter squared. This was specific to the equipment we used so if you use a different pyranometer you will need to do the math yourself. Pyranometers are important for research because they allow you to see how solar panel output changes with solar intensity. We are particularly interested in how solar performs in the winter time in our climate. It is cold but often the sun is shining. With a pyranometer in our system we will be able to draw more meaningful conclusions from our data. Today I travelled to Bridgewater, NS to help an industry partner repair a Web Energy Logger (WEL) installation. The solar system uses 30 evacuated tube collectors to supply heat to an in-floor heating loop and dumps the heat in the summer time. Since I did not take part in the original monitoring system installation this presented challenges that were new to me. I had to look over the monitoring system to understand what it was doing before I started work. I needed to not just be able to understand how it was working, but also make sure that it was working. I located the sensors that were installed and tested their readings against readings on my temperature gun. I found one sensor that was not reading properly and replaced it with a new one. I also installed a current sensing switch on the glycol pump to detect when it is running. Since the in-floor heat loop has a constant flow rate we don’t need to install a flow meter to determine the heat provided by the system. I programmed the WEL with some thermodynamics calculations related to mass flow and it now calculates the energy output in kWh. The repair job took just over an hour and I gained valuable experience in interpreting the work of others. Its easy to jump in and repair a system you set up yourself but when you are trying to follow the work of others it can be a challenge. Pictured below is the box containing the WEL and router (LEFT) and the building with evacuated tube solar collectors on the roof (RIGHT). Today Travis, Gord, and Alain installed the Programable Logic Controller (PLC) system they designed to monitor the solar photovoltaic. Photovoltaic panels are the solar panels that produce electricity. Since there is electricity involved extra precautions need to be taken when doing work on the system. 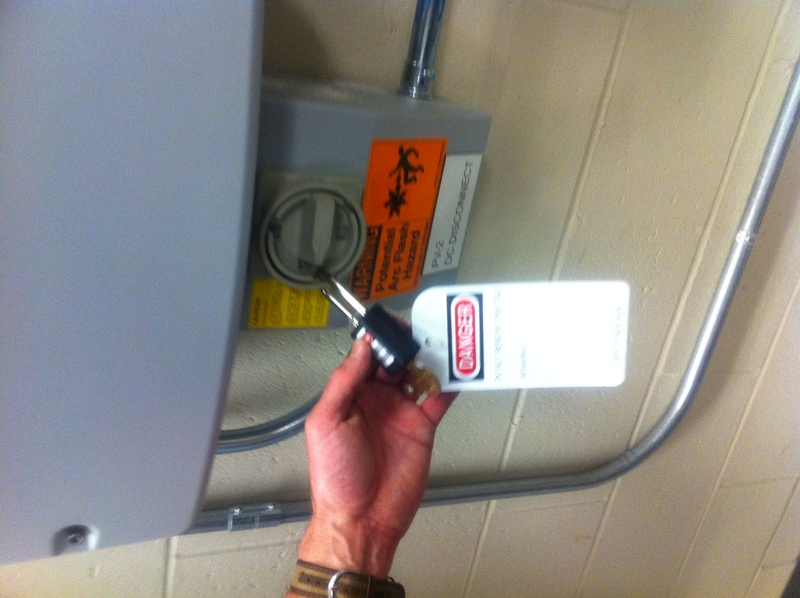 Lock Out / Tag Out is a procedure that involves turning off all sources of electricity and locking them in the off position with a padlock. It also requires a tag be added to the lock explaining what is happening. The key to the lock is kept so that only the person performing the work can turn the equipment back on. This prevents someone from inadvertently turning the power back on and electrocuting those doing the work. Gord Wilkie presented the procedure to Gary Williamson who is the facility manager and it was approved. 1) Open the solar AC disconnect and lock and tag. 2) Open the solar DC disconnect and lock and tag. 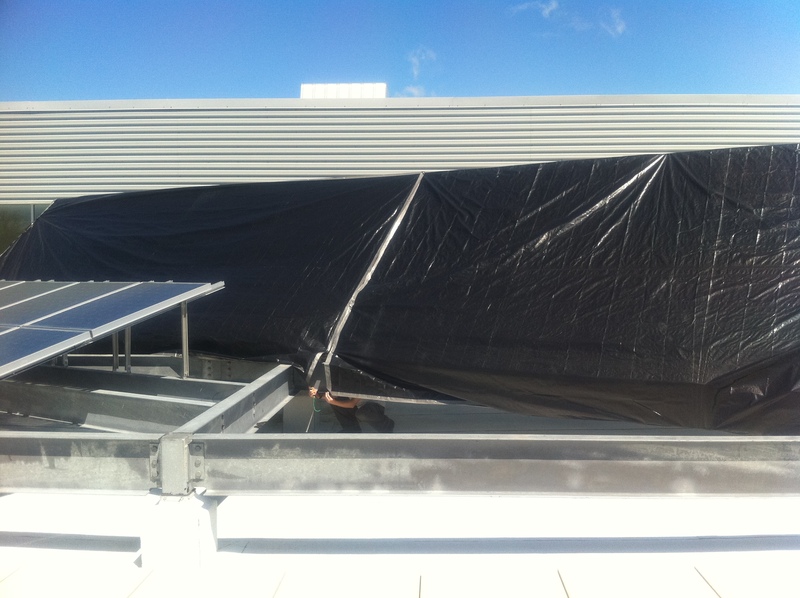 3) Securely cover solar panels with an opaque tarp. 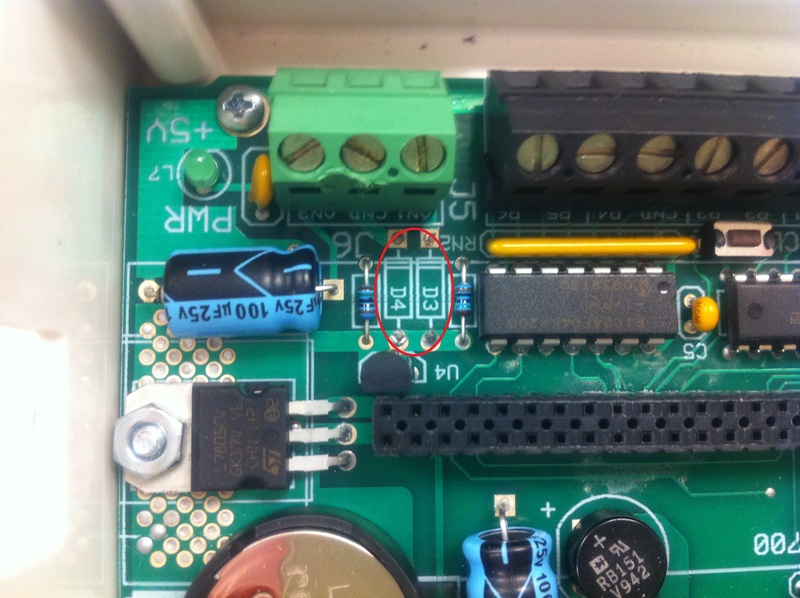 4) Measure DC strings and ensure voltages are at zero. Once the work permit was issued they installed the PLC monitoring system. 1) Surrender the work permit. 2) Ensure all covers on monitoring box are in place. 3) Remove tarp from solar panels. 4) Close solar DC disconnect by removing the lock and tag. 5) Close solar AC disconnect by removing the lock and tag. 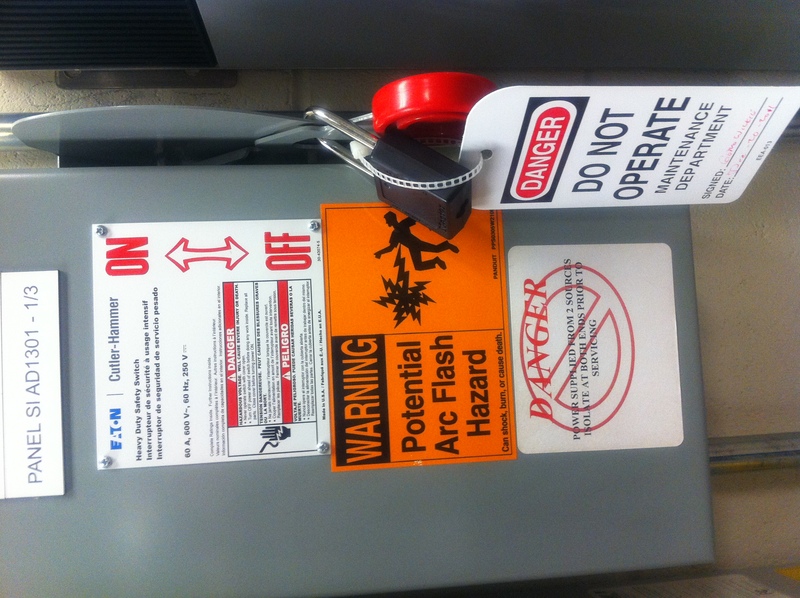 Safety is paramount when working with high voltage and I am happy to report that nobody way hurt. Their PLC system is working and we will start getting data immediately. The solar thermal monitoring project is moving along despite a couple of setbacks. We received the wireless equipment in the mail and were able to set up the wireless bridge to the schools wireless network. We used a directional antenna to improve the reception because the school’s wireless signal on the roof is weak. We put a 12V deep cycle battery on the roof and we did a test run. 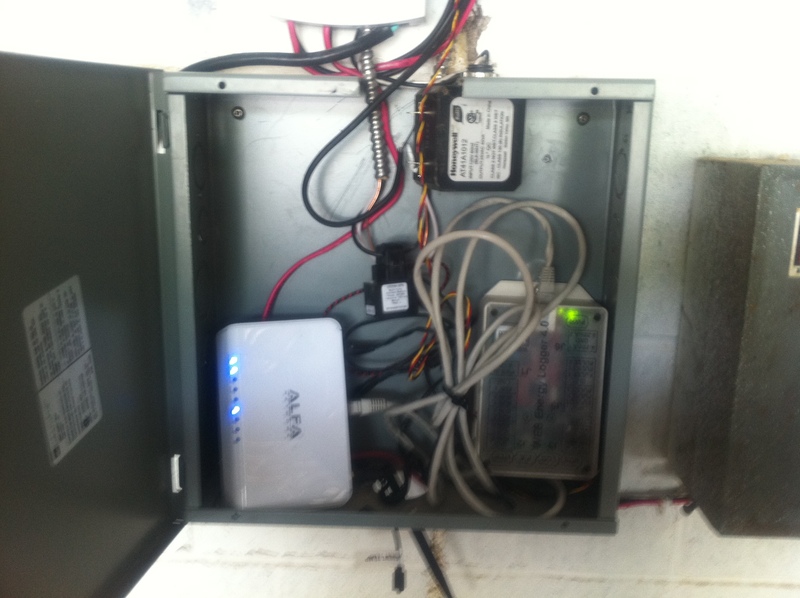 It was able to power both the router and the Web Energy Logger (WEL). The battery is rated at 90 amp hours and the load for both the WEL and router is 0.4 amps combined. This means we are able to get over 3 months of power off the battery before we will need to swap it out for charging. This is good news because the battery is very heavy! Testing with the pyranometer hit a bit of a wall initially. As I mentioned in my previous post the pyranometer measures the solar intensity in watts per meter squared. Since we are converting the 0-5V signal on the pyranometer to a 4-20 mA (milliamp) signal for the WEL we needed to scale the results. We did the math calculation and did a test run. We weren’t getting to the proper numbers in the upper ranges. Once we were confident the math was correct we tried numerous 4-20 mA devices with the WEL and had the same result. It really pays to have an electrical engineering student around when you are trying to troubleshoot electrical problems. Travis Keeping is our electrical expert at the lab and he a bunch of tests for us. In the end a call to Phil Malone from OurCoolHouse.com who designed the WEL was all it took to discover our problem. Turns out that the WEL has a defect and there are two zener diodes that we will need to snip out of the circuit and it should work fine after that. Phil also told us that new versions of the WEL will have a voltage port so we won’t need to convert the signal in the future. We have another WEL on order and it will have the voltage connection on it. The wire we chose for the sensor wire run was cheap wire and it started giving us grief. We used a 75m run and it had too much resistance because it wasn’t twisted pair wire. Twisted pair wire helps to reduce the electrical noise on the signal. We started getting “shorted bus” errors on the WEL. I took the wire run down and we will be replacing it with CAT 5 wire, which is what is used for computer network cables. Once the new wire is installed we should be able to go live. Today we had a visit from Wayne Rostad at the research lab. Wayne is the former host of CBC Television’s “On the Road Again.” Wayne is building a house in Jeddore, NS and it is too remote to be connected to the electrical grid. He came by the campus to see some of our renewable energy equipment in operation and get some ideas for an off-grid system. He has a lot of wind at his location so we showed him some wind turbines in different energy classes to give him an idea of his options. We also showed him some solar photovoltaics as well because he is considering a wind/solar hybrid system. I hope we’ve left him with some good ideas for his home! I think there might be potential for LEED (Leadership in Energy and Environmental Design) certification as well. Since his home is not finished being built it is a candidate for LEED for Homes. Wayne is no stranger to the camera so we snapped some pictures with him before he left. Each year NSCC puts out Success Magazine to publicize recent projects among students and staff. This year a project involving our lab was selected for printing! Dr. Alain Joseph who heads the Applied Energy Research Lab obtained a grant through NSERC (Natural Sciences and Engineering Council of Canada) to work to improve the performance of solar energy systems in Atlantic Canada. Dr. Joseph hired 8 students to help with the project over the course of the year. 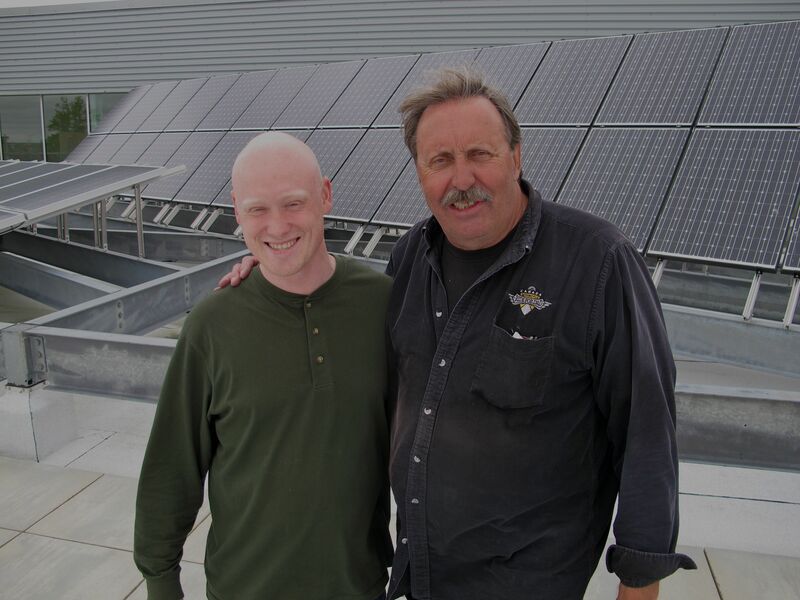 Travis Keeping from the Electrical Engineering Technology program and his instructor Gord Wilkie helped design a Programmable Logic Controller (PLC) to monitor solar hot water. The monitoring system was deployed in industry and will provide clues to the availability of solar energy in our climate. Since I came on late in the project my work involved examining low cost alternatives to the PLC system. My work using the Web Energy Logger (WEL) was based around trying to provide the same information as the PLC system. I believe it is important to have low cost alternatives because not every system is big enough to warrant the expense of PLCs which can be in the range of thousands of dollars. We are currently deploying both a PLC system and a low cost WEL on the solar equipment on the roof of the Waterfront Campus. I have attached a scan of the article here. 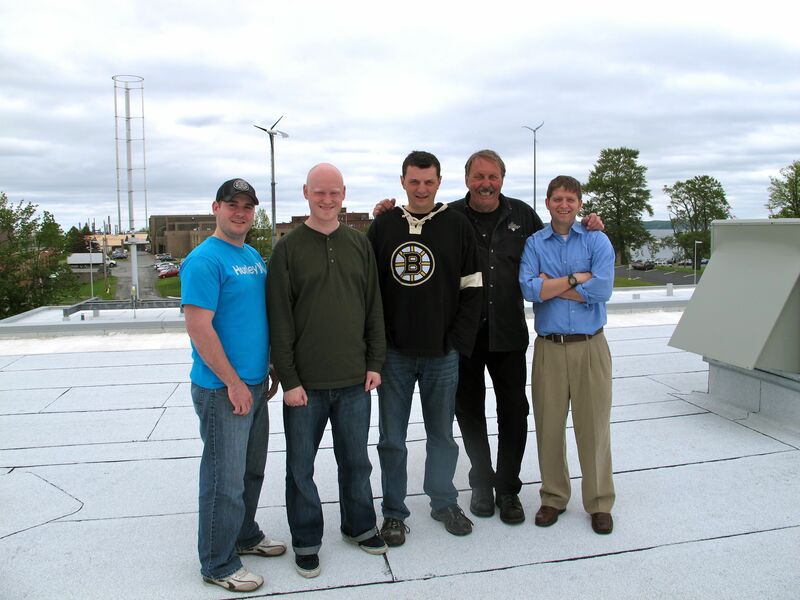 We are working on an electronic monitoring system for the solar thermal gear on the roof of the NSCC Waterfront Campus. 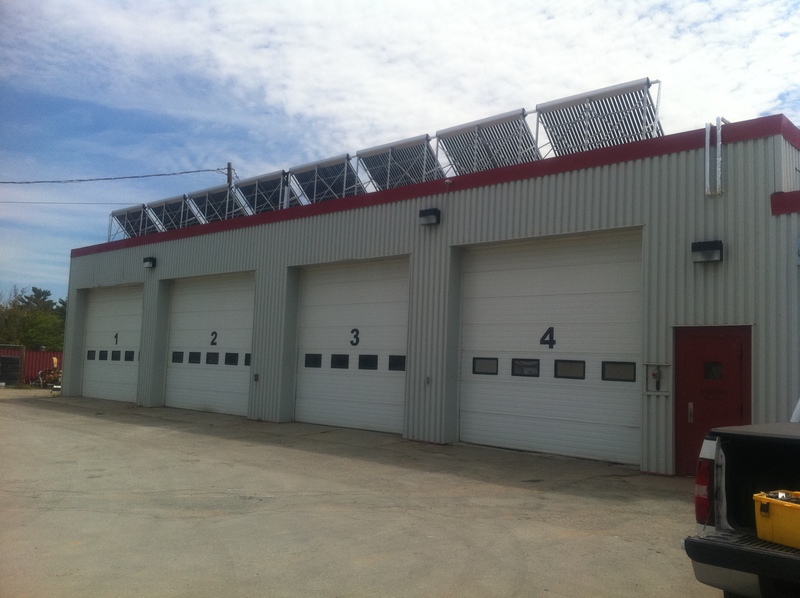 The roof has 2 arrays of Thermodynamics flat plate collectors as well as 2 arrays of Thermomax evacuated tube collectors. We will be monitoring the glycol temperatures, outside air temperature, and solar radiation. The data logging will be done using the Web Energy Logger (WEL) over the Wel Server. I have installed the temperature sensors and programmed the logic for the calculations inside the WEL. We are interested in adding flow meters to this project if we can find ones within our price range and get permission from facilities management to install them. The challenge with working on the roof is that there isn’t power or wired network access. The campus has a very weak wireless signal on the roof and I will be connecting the WEL to the internet that way by using a wireless bridging router. The router runs off 12V and the WEL can also run off of 12V. For now I will power the entire setup off of a large deep cycle battery and it will need to be changed and charged from time to time. 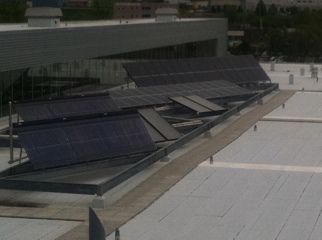 NSCC Applied Research may add a photovoltaic panel to the roof to power the equipment and charge the battery at a later time. This project is unique from the residential and commercial installs I have done in the past because it will be used primarily for research. An electronics student at the college was able to design us a voltage to milliamp converting circuit board that will allow us to connect a pyranometer with a voltage output to the 4-20 mA input on the WEL. By using a pyranometer and air temperature sensor I will be able to match the energy output to the solar radiation and determine the energy efficiency of the gear. I will also be able to do statistical analysis over time. The lab will be very interested in the variance of the different readings and how they relate to each other. By comparing sunny days in the winter to days with the same amount of solar radiation in the summer we will be able to determine the effect of outside air temperature on the output of the different types of collectors. This is of particular interest because our winters are cold but the sun is usually shining. I will be posting more information as this project progresses. The Thermomax evacuated tube collectors are the dark blue tubes on the left of the roof. The Thermodynamics flat plat collectors are the small grey rectangular panels with the black border. Today I conducted a little test to compare the performance of two low cost solar site assessment tools. I consider low cost to be anything under $1,000. These tools provide infomation about the amount of available sunlight that falls on a surface. They do this by examining the landscape features in the area that provide shade at different parts of the day such as buildings and trees. These tools provide a percentage of available solar radiation you can expect to receive. This can then be combined with weather data and solar panel information to perform preliminary energy calculations using energy modelling software. This site assessment information is supplied for each month however for the purpose of this test I am only going to compare the total annual values. Solar pathfinder image. The black areas inside the ring mark the obstructions in the surrounding area. This image is traced using computer software. 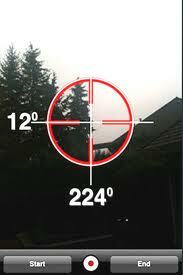 The Solmetric app lets you trace the obstructions directly with the iphone. Both of these tools require tracing so they have a element of human error involved. When using the pathfinder you take a picture of the equipment and trace it using the computer software. When using the Solmetric app you trace the horizon directly with the iphone. Given the close proximity of the results I don’t really feel as though one is any better than the other from a performance standpoint. When you consider the price the Solmetric iPV iPhone application is the clear winner, but only if you already own an iPhone. Solmetric also makes professional site assessment tools in the $2,000 price range that do not require any manual tracing and are remarkably accurate. 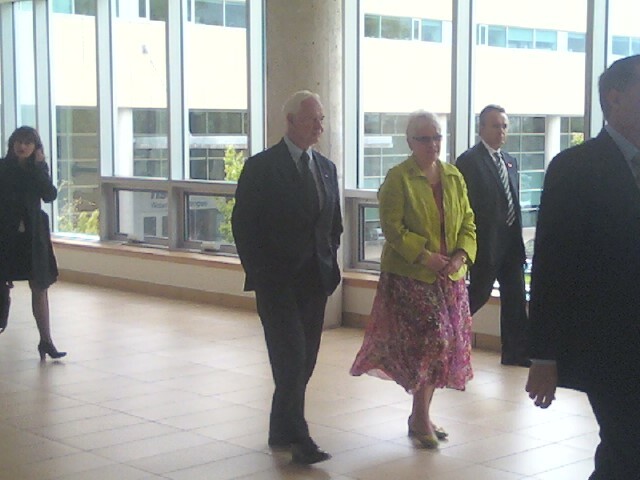 Today was an interesting day at the lab as the Governor General of Canada came to visit the campus. His Excellency the Right Honorable David Johnson replaced Michaëlle Jean in 2010. He didn’t have time to stop in and talk with us in the Applied Research lab but he did take a few minutes to view the renewable energy gear on the roof. The day today was largely unproductive and filled with anticipation. I’m sure it was this way for most of the staff today, but how often do you really have such an important guest? I snapped this picture of him on his tour of the building.